Jello shots look very cool and taste fantastic. Many alcoholic drinks can not be prepared in advance. Serving jello shots is a great way to give you some extra time to relax at your event or party. You can bring them out ready to serve and enjoy with your guests instead of spending your time mixing drinks. This Giant Jello Shot is easy to prepare and even easier to serve. You can serve as many guests as you like all at the same time. If you are hosting a large event simply use a bigger watermelon. To make you only need three simple ingredients. These are a watermelon, vodka and Jello mix. The preparation method is very simple as well. First, cut the watermelon in half and hollow it out. 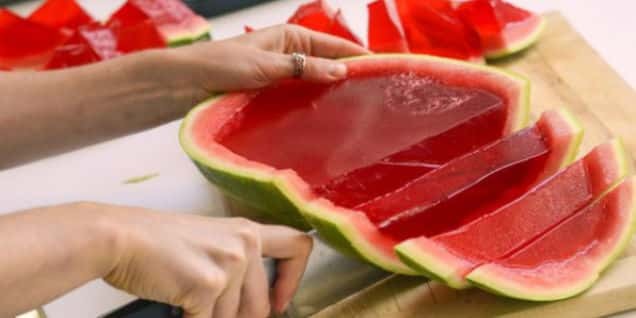 Once you have done this you can pour your Jello and vodka mix into the shell and refrigerate. Your Giant Jello Shot will taste great and make a fantastic centerpiece for your party table.